When a rhubarb flowers, this is called bolting or going to seed. When rhubarb goes to seed, this is perfectly normal. 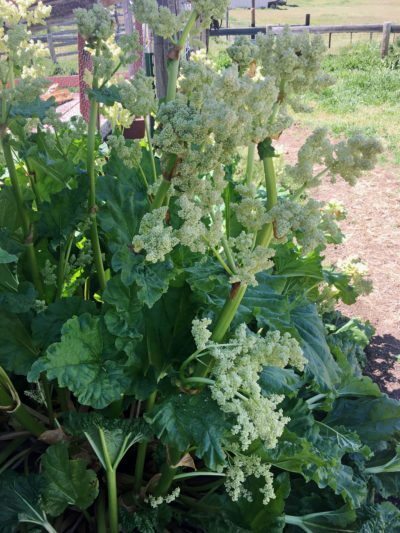 The rhubarb plant is doing what plants are supposed to do and that is to reproduce, but there are some factors that can influence how often you get a flowering rhubarb. Variety – Some varieties of rhubarb flower more than others. 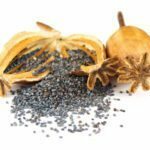 Heirloom varieties tend to flower more than modern cultivars. Victoria rhubarb, MacDonald rhubarb and Red Crimson rhubarb are some examples of rhubarb varieties that will flower more often. 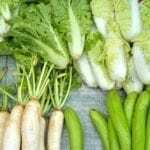 Maturity – Plants need to reach a certain maturity in order to reproduce through seed. For a rhubarb plant, that maturity comes a few years after it is planted. The older a rhubarb plant is, the more the rhubarb goes to seed. Heat – Rhubarb plants grow best in cooler temperatures. If you have an unusually warm spring, this can cause a rhubarb to start flowering. Stress – Stress can also force a rhubarb to flower. Stress can come in the form of a lack of water, pests, lack of nutrients or animal damage. Anything that makes the plant feel threatened can cause it to start flowering. In order to keep rhubarb from bolting, you need to decide why it is flowering. If it is flowering due to variety, you can consider getting a more modern variety that has been bred to flower less often. But, keep in mind that flowering rhubarb is really more of an annoyance and does not ruin the plant. If you have an established rhubarb clump that is several years old, you can consider dividing the clump. This essentially turns back the clock on the plant’s maturity and will help reduce rhubarb flowering. If you are expecting a warm spell, consider mulching around the plant to help keep the roots cool. Also, make sure that your rhubarb is as stress free as possible. Watering during dry spells, regular fertilizing and keeping an eye out for and quickly treating pests and disease will greatly reduce the amount of flowering. Should I Let My Rhubarb Flower? There is no harm in letting your rhubarb flower, but keep in mind that energy the rhubarb plant puts towards making a flower and growing seeds is energy that will not being directed towards growing leaves. Since rhubarb is grown for the stems, most gardeners choose to remove the flowers as soon as they appear so the plant can focus its energy on leaf growth. Rhubarb flowers can simply be cut from the plant as soon as you see it appear. If your rhubarb produces a flower, this does not affect the stems and leaves. The stems can still be used in cooking (though the leaves are still poisonous). A flowering rhubarb can cause a bit of alarm for a gardener, but now that you know more about why rhubarbs bolt and how to prevent or fix it when it happens, there’s nothing to worry about. You can still enjoy the wonderful taste of rhubarb grown fresh in your garden.